Join the discussion on our forums! Come discuss Hogger, Doom of Elwynn over in our dedicated Hogger, Doom of Elwynn discussion topic. Been using this with Scourgelord Garrosh. Not amazing, but it can provide a lot of value in the right situation. Just posting for the idea here but in Warlock you can play: Hogger, Doom of Elwynn + Defile For an 8 damage clear of 1 damage each. If for some reason you need to do 1 damage at a time this is the card to do it with. Maby some combo with an Bittertide Hydra for 24 damage. This should be stronger in Stats to playable in Standard. Good in priest and (patron) warrior. 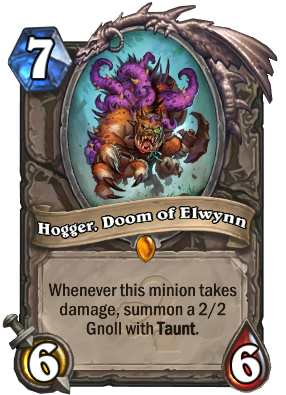 I think his slightly worse than troggzor, but troggzor got overshadowed by boom, so maybe hogger quite good in standard? Im not crafting him yet, but he is quite high on my list of things to craft. 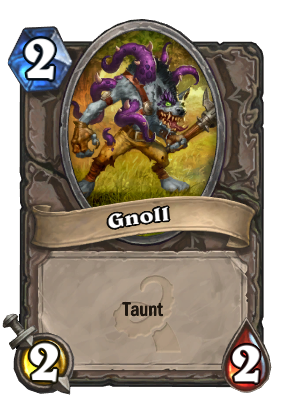 This card is by far better than Troggzor. I think I found a bug. The enemy mage cast Blizzard and the Gnoll summoned was frozen but not damaged. Blizzard does damage then freezes so..
1: Blizzard is cast and does 2 damage to the minions. 2: RIGHT after the damage is done, the minions are summoned. This is the real Warrior Legendary!!! Calling it now, this is a C'Thun counter and will eventually be very widely used. It can soak up 18 points of damage from those 'eyeball missiles'.